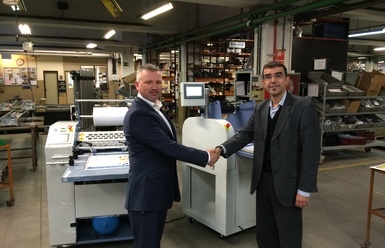 In 2014 Binding Store acquired the sole UK agency for Spanish based laminating manufacturer Tauler. Tauler are a family business that have been producing laminating equipment for over 40 years and in this time have built and supplied over 3000 machines. The range of Tauler Laminating Machines includes 6 laminators that start off at entry level semi automatic B3 laminators and go up to large format, high volume B1 machines. All of the Tauler range is constructed in Spain to the highest standards, with top electrical components being used and heavy duty steel on the larger heavy duty laminating systems.